Welcome to this month’s book club! On the fourth Monday of each month, we post a round-table discussion about a speculative work (or work of interest to readers of SF), and we invite you to join us for further conversation in the comments. July’s book will be The Dazzle of Day by Molly Gloss, and other forthcoming discussions are listed here. This month sees a two-part discussion of Arthur C. Clarke’s Rendezvous With Rama, the story of an exploratory mission to an alien spacecraft (named “Rama” by human astronomers). First published in 1973, it went on to win the Nebula, Hugo, Locus and BSFA awards, among others, and is an acknowledged classic of the genre. Karen Burnham, vocationally an electromagnetics engineer and avocationally a science fiction critic and book reviewer. Her writing appears in venues such as Locus, NYRSF, SFSignal.com, and Cascadia Subduction Zone. Her book on the work of Greg Egan came out from University of Illinois Press in 2014. Professionally she worked for several years on NASA projects, and currently lives near Baltimore in the United States. Vajra Chandrasekera, a writer from Colombo, Sri Lanka. His fiction has appeared in Clarkesworld, Lightspeed and Black Static. For more, see his website or follow him on Twitter. Martin McGrath writes a bit, shouts a bit, and thinks about stuff a bit. He has reviewed SF&F for places like Vector and Arc, had about twenty short stories published and currently teaches media studies and public relations at Middlesex University. He gibbers inanities as @Martinmcgrath. Ethan Robinson, an American critic who blogs at Marooned Off Vesta. Vandana Singh, a physics professor at a small and lively state university. Her critically acclaimed science fiction stories have been published in numerous venues, most recently at Tor.com, and several have been reprinted in Year's Best anthologies. Her website is at http://vandana-writes.com/ and she blogs at https://vandanasingh.wordpress.com/. How well do you think this book holds up, forty years after it was first published? How has your attitude toward it changed since you first read it (whether forty years ago or more recently)? So wow, this was really refreshing! A mixed-gender, mixed-race, comfortable-with-polygamy team and society with some solid world building involving asteroid threats. I liked it much more than I thought I would. Certainly I have some critiques (especially involving the lack of actual characters, which perhaps we'll touch on later) but I thought that the overall impact of the novel stood up very well. For the longest time my favorite Clarke novel was 2010 , and I was happily surprised at the similarity between that and RwR (and even more surprised that I hadn't realized it before). Martin McGrath: It's funny how books stick with you. I first read this in 1979 or 1980—I was ten or eleven—and it immediately became one of the books I loved. It's one of the very few books that I've read numerous times for pleasure and one that I can come back to again and again. 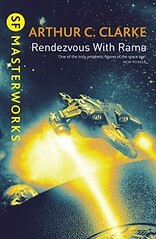 I like lots of Clarke's work, but Rendezvous with Rama is my favourite. It was Rama itself—by far the book's most developed and most interesting character—that won me over first and it still seems like an astonishing feat of imagination. It's the (almost) personification of that vast, cool universe that just doesn't care about us but that we just can't resist. I sometimes worry that Rama had far too much impact on my teenage love life. . . . But even back when I first read it I remember being amazed by the one element of the diversity of the cast of characters. Growing up in a religiously conservative community I'm reasonably sure that Clarke's writing was the first time I came across the notion of gay (and bisexual) people in a way that wasn't straightforwardly critical. What was even more surprising was the way that he doesn't make a big deal out of it—unlike someone like Heinlein, the sexuality isn't "weird" to show off how broadminded the writer is, it's just there because that's the way people are. It's the same with race and gender. As Karen points out, if you're not paying attention you can easily miss it. And that's one of the reasons I still like Clarke's work, and Rendezvous with Rama in particular. He's just hopeful that we can grow up to be better and more tolerant than we are now and there are too few books like that. Obviously there are shortcomings—Clarke is a better writer than many of his contemporaries (and certainly the other two of the "big three") but you wouldn't call him a stylist. However, I still think the book stands up, and Clarke's writing is clean and still mostly sharp. His sly jokes still make me laugh too. One thing that struck me rereading it this time (and paying attention to the context in which it was produced) was that, written in 1972, it's one of the first big post-Apollo science fiction novels. There's a moment when Pak is flying over New York and he looks down. In a lot of SF novels this would be a moment of revelation, but he doesn't discover anything and instead says something like the pictures he's taking will keep scientists working for decades. That seems very different from most science fiction where discoveries are the product of an individual genius. This is science as massive collaborative effort—which is also a modern thing. Ethan Robinson: The biographical bit—I first read Rendezvous sometime in nebulous childhood and have revisited it pretty constantly ever since. My most recent re-read before this one was . . . probably about a year ago. I'm honestly struggling with how to answer this question because, at the risk of engaging in reckless acts of hyperbole, I want to say that it feels sort of like asking "How does the Iliad hold up, these millennia later?" The book reads differently now than it did forty years ago, I'm sure (and it reads differently for me now than it did when I was a kid, or a teenager, or in my twenties, etc. . . . ). And there are vast swathes of conceptual ground where I, to say the least, differ from Clarke (I agree with Karen and Martin that the depiction of gender, race, and sexuality can be refreshing, but there are problems, too; and though some of his more disturbingly nigh-on-fascist-but-friendly! politics are more submerged here than they are in, say, many of his non-fiction writings, or later fictional works like 3001 , There Are Hints). Some of this feels "dated," though much does not. And to be sure to call any work of art "timeless" begs the question at best. Nevertheless, though, I want to say that the core of Rendezvous with Rama , the wonder and mystery and joy I feel when I read it, remains untouched by time, and whether it actually will or not it feels to me as though it always will. 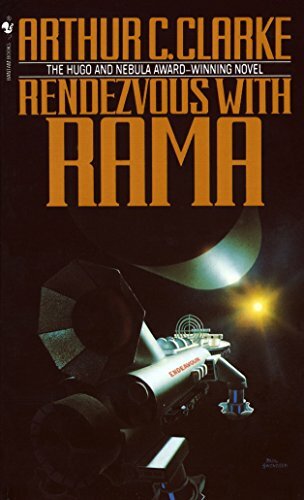 Vajra Chandrasekera: I've only read Rendezvous with Rama twice: the first time a little over 20 years ago, and the second time last week. It didn't make a big impression on me the first time, I'm afraid: around that time I was reading a lot of Clarke back-to-back, and Rendezvous suffered by comparison. I probably preferred something like Childhood's End at the time. I remember Rendezvous just felt like a secondhand Odyssey . . . . Sorry! See, part of the problem here is probably that I also read all the sequels in fairly short order (the last one more or less as it came out) and, er, strongly disliked them. I'm a compulsive series-finisher even when I dislike books, it's a sickness. So after that experience I remembered Rendezvous mostly as a bland, abbreviated prologue to this Rama series that I didn't like. On rereading the original now, though, I like it a lot more than I did the first time. Maybe it's just that this time I determinedly read it as a standalone book with the intent of rescuing it from the taint of the sequels? (It's a bit like rewatching season 1 of Lost and pretending it got cancelled there.) It seems more austere than bland to me now, and the gradient between the "how does Rama work" story and the "what does Rama mean" story is more graceful than I remember. The ending (considered as an actual ending, and ignoring that last line, which I never understood why Clarke stuck in and then insisted that it wasn't a sequel hook; I can't imagine any other sense in which that line makes sense. Maybe I need to read it again?) actually works for me as a kind of orthogonal, mildly un- Odyssey gesture, Clarke upending his own trope. This time, the big god-aliens aren't interested in uplifting anybody and all of human civilization is just the mold on the bathroom wall of gas station Sol somewhere on the side of an alien highway between points unknown. Er. But like, not in a depressing way, because their engineering and their goals are still comprehensible. It's a difference of scale, but not of kind. It holds out hope that someday, we too can thrust enormous phallic objects at distant civilizations and ignore them when they freak out. It's . . . aspirational. Ethan Robinson: Oh, lord, the sequels. I am firmly of the opinion that There Should Never Have Been A RwR Sequel At All, and even at that the sequels go out of their way to be terrible. (And honestly . . . expanding RwR , with its "they do everything in threes" mantra, into a four-book series ?) One of the miracles of this novel for me is that the extreme badness of the sequels doesn't even touch it. Vandana Singh: RwR was one of my childhood readings that made a deep impression on me. I think I read it during the pre-teen or early teen years, having previously read Asimov and some truly dreadful Tom Swift books. The thing I loved about it then was the mystery and the sense of wonder at the unknown. This was about the time when my siblings and I would sometimes sleep on the rooftop of my grandparents' house during the summer holidays, and we would look up at the stars and wonder about other worlds and other lifeforms. It was this sort of wondering, fed by science fiction, that ultimately led me to a career in science. I have just finished rereading the book. It kept my attention and was a lovely intellectual exercise (loved the physics/climatology)—it also excited the good old sense of wonder. I was irked by the continued references to “man” and “mankind” standing for all humans, although of course that was the norm at the time—and that made me realize how I'd internalized that too, for much of my life. I didn't realize the subtle sense of exclusion such words implied until several years ago when I started using and hearing words like “humankind.” It is interesting that in the book women are given leadership roles and yet the archaic gendered words for our species are still intact. I liked the fact that there were polyamorous relationships that were anything but unusual in the world of the story (but are only men privileged in this way?). Despite Clarke's having resided in Sri Lanka, though, we only have one off-site South Asian scientist, Dr. Bose. Although the implication is that people like Norton are of mixed race, most of the characters read fairly Western to me. I did cringe a bit at the naming of the "cities" after Earth cities—this being something of a colonial practice—at the very least it seems rather silly to name alien artifacts in that manner. All that said, though, I enjoyed the book. I loved the gradual revealing of Rama's secrets, the elegant majesty of its functioning, and the suspense as to what it might do next. Clarke is a much better stylist than Asimov and he isn't afraid of exploring the emotional lives of his characters through all the action. I would have liked to see more of how the experience of Rama might have changed the characters and their relationship to each other—the relationships seemed to be relatively wooden and static. I am glad I was able to enjoy RwR as much as I did. When I re-read the Foundation series a few years ago, I couldn't finish the books. In fact I wanted to throw them across the room. That didn't happen with RwR , which I read in a totally absorbed fashion in two sittings. I think the strength of the book is its elegant (if somewhat distant) writing and the equally elegant intellectual thrills and sense of wonder. Ethan Robinson: Short answers: science; no, but it tries; the encounter between explication and the inexplicable. The first sentence of Rendezvous with Rama is "Sooner or later, it was bound to happen," and the novel that follows is obsessed with inevitability—specifically the inevitability with which events follow physical law. It is fascinated with the phenomena associated with distance, gravity, and acceleration: all the talk in the Rama Committee chapters about the communications lag enforced by the speed of light leading up to Lieutenant Rodrigo's efforts to defuse the bomb before it has time to receive new instructions from Mercury; the loving detail with which the effects of centrifugal "force" inside Rama are described, over and over; the mechanics of orbital movement; etc. Joanna Russ says that "Science is to science fiction (by analogy) what medieval Christianity was to deliberately didactic medieval fiction." Medieval European literature went to God and the Church for its authority; science fiction—of the traditions Clarke worked in, at least—goes to modern science for its. But of course it can't work the same way. The opening chapters sort of curve into narrative much as Rama does into the solar system: parabolically from elsewhere. The Voice can talk with such assurance and calm, even about events as catastrophic as the asteroid impact, because it Knows The Facts: asteroids follow paths defined by predictable gravitational effects, say, and even when something unexplained intrudes, there are processes through which it can come to be explained. And the tone this creates is so powerful that it's able to maintain itself even when it does arrive at narrative and begins telling us, not how this body moves through the solar system or how that body reflects light, but what people did and said and thought— especially because these human actions are always secondary to the project of explaining the enormous factual event that is Rama. I have the same objections to the Earth-city nomenclature that Vandana raised. I think though that one thing this book presents us with—though I highly doubt Clarke meant it this way—is the failure of the (imperial) assimilation, and/or conversion, of the unknown to the known. The crew of the Endeavour , with its European-expansion-idolizing captain, "names" some of Rama's features after Earth cities, but as soon as they actually encounter these features directly they have to admit that they have nothing in common with cities at all, let alone specific ones. And that's just one example—throughout the novel, in all its loving and—to be sure—beautiful cataloging of Rama's contents, people are quick to name the alien after the human (beginning with Rama itself, though in these terms it's an interesting choice considering the other Rama's dual human/divine nature), to try to reconcile what they're seeing with what they already know, and the attempt always fails. Speaking of medieval literature, it all puts me in mind of Sarah Tolmie's suggestion that "the drama of representational failure" is, for Langland, the only way to "indicate" Christ, whose "divine being cannot be conveyed in language." Jimmy conceptualizes the "South Pole" of Rama as a giant cathedral, but then rejects the thought and is chilled by the speculation that "Perhaps the Ramans felt that they already knew the ultimate secrets of the universe, and were no longer haunted by the yearnings and aspirations that drove mankind [sic]." Later, he sees a "flower"—the only sign of life per se that they have yet encountered—and immediately: "he was determined to possess it." He succeeds—and the "plant" from which he plucks it dies. Despite Clarke's enthusiastic and unreflective identification with both European "exploration" and science, what could better allegorize their violent aspects? Rama itself, meanwhile, cannot be possessed, and at novel's end it emphasizes this by behaving in a manner that calls all of the inevitability that the novel has been living with into question: impossibly, Rama accelerates reactionlessly. There is no suggestion of magic, beyond the Clarkeian "any sufficiently advanced technology" sense, but for this novel that has been so obsessed precisely with the inescapability of Newtonian mechanics—albeit as revised by relativity—to present their utter flouting as its climax is astonishing; it throws everything into doubt and confusion. But it's not quite the end. There is still one more chapter, four pages in my edition left to go before that final sentence that, as Vajra pointed out, strikes such a strange note. It's probably the most embarrassing chapter in the whole book—and not least of what it embarrasses is my whole way of reading the novel. With its personal character moments and its awkward ribaldry, with its reassurances that there will be further opportunities for explication, it seems to retreat not only from the impersonal authority of the bulk of the novel (as it should, this authority being no longer available) but also from its refusal. It tries to come to a novelistic conclusion, but in the face of what has happened all it can do is bluster for a minute—longer than I for one would wish—and then collapse into silence. Where Vajra's phallic comments fit into all this I'm not exactly sure, but they're obviously relevant somewhere. Karen Burnham: I'd say that the Voice that establishes the opening chapters is drawing as much from the weight of History as of Science. The "future history" mode of science fiction was well established by the early 70s, and was one of Heinlein's favorite frameworks as well. The dry voice and distanced approach to the world building reads like a particularly well-written textbook, and normal schooling tries to train us to not question things that we learn in that way. So when Clarke talks about the asteroid that wiped out large chunks of Italy, we respond with as much acceptance (and lack of emotional engagement) as when we might read about any other historical tragedy. One thing that really impressed me in the world building was the fact that Clarke describes a scenario uncomfortably like our own: we went to the Moon ( Rendezvous with Rama was written after the Moon landings, which Clarke so memorably experienced in a TV studio), then basically stopped manned spaceflight until something went horribly wrong (the asteroid strike) at which point humanity finally poured enough resources into planetary defense to make occupation of the solar system feasible. I'm not sure that so many SF writers at the time saw the pullback from space exploration that, in hindsight, was already occurring in the early 70s. Whatever your beliefs about the feasibility of the world's economy recovering from that kind of devastating disaster to get back to space flight so quickly (I suspect that the aftermath of that kind of impact would actually look more like the end of one of Stapledon's chapters in Last and First Men —another book that reaches for the impersonal historian Voice for its story), in retrospect Clarke looks pretty perceptive. And, let me add to the pile-on of hate for the sequels. I think I read two of them before I realized that I didn't have to finish series or books that I didn't like, and I had way better things to do with my time. Ugh. From Vision of Transcendence to claustrophobic soap opera in way too few pages. Vajra Chandrasekera: I've always liked Clarke's prose, that wry, disinterested voice. RwR 's narrative is actually even more distant than I remembered: we don't so much as see a character for several chapters. But this is not unusual in this type of story, is it? (Nor is it particularly dated, given that I was just reading the new Neal Stephenson, Seveneves , and it opens in the exact same way, a slow pan with voiceover over a disaster that leads to a big engineering project.) It gives the whole thing the air of a future history, a post-Rama humanity looking back on Project Spaceguard from a future that just knows that really big engineering projects are indistinguishable from godhood. I think it works rather well, in a relatively short book, and better than I remembered. On what Vandana said about Dr. Bose being the only South Asian character: I was amused during my reread to remember just how readily I assumed, as a teenager, that Carlisle Perera and maybe even Boris Rodrigo were of Sri Lankan descent. Back then I hadn't quite cottoned on to the idea that colonial names like Perera and Rodrigo—which are both very common names in Sri Lanka, especially the former—were also necessarily common elsewhere. This impression was only strengthened by knowing perfectly well that Clarke wrote this in Colombo, overexposed to Pereras and Rodrigos in their legions. No offence to any passing Pereras and Rodrigos, some of my best friends &c.
I like what Ethan was saying about this being all about a (failed) imperial assimilation. I read Norton's obsession with Cook as a mechanism for this. First, Norton is described drily as "the world's leading authority" on James Cook, which I read as mockery. It's difficult to take it literally—why would a random spaceship captain be more of a Cook scholar than professional historians? So it seemed like the text was making fun of Norton's naive, uncritical reading of Cook, his rhapsodizing about how Cook was a humanitarian to "the often hostile savages in the new lands he discovered," for example. So Norton's not so much a Cook scholar as a fan, right down to the poster on his wall that he talks out loud to. (OK, he only did that the one time but you know how it is. I've got him pegged as a talker-to-portraits now.) He does that in the scene where he's rationalizing his decision to sabotage the Hermian missile, which seemed to me the point at which the Cook metaphor inverts itself. We start off with Norton self-consciously positioning himself as Cook and Rama as the terra nullius to be conquered, if only intellectually, and its strange robot denizens seem to be in the position of the "hostile savages." But then this image flips over: Rama, on its voyage of discovery and empire to the Large Magellanic Cloud, turns out to be Cook and Norton has to acclimate to being merely a hostile savage. And that telescoping of scale, that sudden widening of perspective, is I think also where the distance of the future-historical voice comes from. The Voice of Textbook Authority, like Karen said, is the voice of a civilization that institutionally understands its position relative to galactic power with painful accuracy. I also found myself thinking that last chapter in its entirety is a kind of smothering pillow of awkward domesticity over all the awe and wonder and whatnot. Like a post-credits bit where the moral is explained, unnecessarily. Also, the personal interactions between Norton and Laura Ernst are just kind of terrible, aren't they? Not just the awkward final chapter, but the terrible dad jokes about "unholstered lady officers" earlier on. . . .
Martin McGrath: I suppose I should start with Ethan's outrage (!) at my claim that Clarke was not a stylist. I wasn't being quite as negative as I think it probably sounded. I admire the way Clarke writes—it is, as I said, clean and sharp and you'd be hard pressed to deny its effectiveness. He's got an enviable ability to stamp indelible images on a reader's mind's eye. When I say Clarke is not a stylist, I suppose what I'm trying to say is that Clarke isn't the kind of writer who wants his reader to be distracted by style—he wants it to be taken for granted, which leads neatly to the point of the second question. The voice at the opening of Rendezvous is the voice of the liberal enlightenment. It's a voice that is calm and authoritative and, above all, reasonable. And it is a voice that seeks to speak to and for all of us. We have become increasingly suspicious of that voice—it's a voice that we have come to see as excluding difference and imposing a set of cultural and political assumptions—but I think we have to accept that Clarke is genuine in seeing it as a voice that represents progress (another idea that's become unfashionable). Clarke, it seems to me, believed, or wanted to believe, in a future where it didn’t matter what you were or where you came from, only who you were and what you did. It’s easy to see why the idea that, underneath all the “clutter,” people were essentially the same and could live with, understand, and trust “the other” would appeal to many writers who wrote and lived in the shadow of the Second World War and the hairiest bits of the Cold War. But I also think that idea must have had a specific appeal to Clarke who, given his personal situation, had spent a large part of his life as an “other” himself. Differences of race, gender, and sexuality, of nationality and ideology, are supposed to fade away as we mature as a species. In Clarke's future you could even hold patently ridiculous views—like believing in an invisible man in the sky who controls everything—and still be relied upon to do the right thing and come to the right conclusions when faced with a nuclear-tipped missile pointing at a giant alien artefact. All that was necessary was that you looked at the mysteries of the universe with a suitably scientific eye—which is why, as Vandana notes, everyone "reads fairly Western." Now the obvious—and valid—criticism of writing in the voice of mature and sane humanity is that everyone who doesn't talk like that is either immature or insane. But I think it's important to note that the closest thing RwR has to a villain—the Mercurians—are driven by a desire to protect their profits and their territory. In Clarke’s better future good (rational) people have grown out of nationalisms and greed and the enlightened voice assumes that the smoothing out of everything else—the erasing of the elements of cultures that define us as different—is a minor side-effect and a price worth paying to escape the evident evils that these failings inflicted on our world during Clarke’s lifetime. Even to the point where relationships—like that between Ernst and the captain—become things of cool, practical regard. There's not much accidental or out of place in that last chapter. For Clarke, passion isn't any less susceptible to the levelling power of reason than religion or the calculation of orbits. What saves Clarke from a horrible Randian positivism is the wry humour that undercuts pomposity, his faith in the basic decency of most humans, and, most importantly, his recognition of the limits of our rationalism. His narrator and his characters not only do not know everything, they cannot comprehend most of what the universe has brought to their door. In a way, this is our salvation. We are not reduced to desiccated calculating machines, mastering the universe via the application of a dull, literal logic. We are still curious. And we are still capable of wonder (sorry, that word). As others have pointed out, the captain's dream of reliving the glory days of Cook is always ridiculous—Rama does not represent a new land for us to conquer, But I'd go further than Ethan. This is not a story of failed colonisation or an allegory for Western exploitation of "distant lands." That's looking at the story through the wrong end of the telescope. As Vajra says, Norton is the "hostile savage." Rama is Cook’s ship, sailing through our waters and barely deigning to notice our hapless rafts. In a way we are, if not innocent, then at least blissfully ignorant of what the universe holds and what it all might mean. We are an indigenous tribe on the beach of a small island and we have almost no idea what this all means or what will happen next. Indeed, I had always assumed that the Ramans did things in threes line was at least partly Clarke’s way of making explicit the link between Rama and Cook—since Cook is famous for his three voyages of exploration. That it enabled deeply unfortunate sequels is deeply unfortunate but I don't think that Clarke was deliberately—or at least predominantly—promising future explication. Check back on Thursday to read the second part of this discussion!